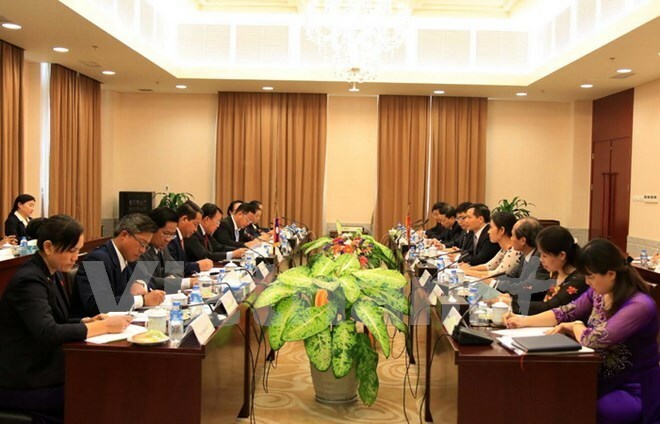 Vientiane (VNA) – Officials from the offices of the Communist Party of Vietnam (CPV) Central Committee and the Lao People’s Revolutionary Party (LPRP) Central Committee highlighted the increasingly practical cooperation during their talks in Vientiane on May 23. The Lao side was led by deputy chief of the LPRP Central Committee Office Chanthaboun Rattanavong while his counterpart Bui Van Thach led the Vietnamese delegation, who is on a visit to Laos on the occasion of the Vietnam-Laos and Laos-Vietnam Solidarity and Friendship Year 2017. The two sides briefed each other about their respective country’s socio-economic development, review their cooperation plan in 2011-2016 and discussed another plan for 2017-2020. They also looked into coordination to prepare for an exhibition on the countries’ traditional friendship and special solidarity which will be held in Hanoi and Vientiane. The officials said both sides have paid attention to delegation exchanges to learn from each other’s experience in advising and serving the two Party Central Committees. They have also regularly shared experience in making agenda; assessing, implementing and evaluating plans and resolutions of the Party Central Committees; and building the offices’ apparatus, working regulations and personnel issues. They also spoke highly of the completion and operation of a project on IT application at agencies of the LPRP Central Committee and another project on building Kaysone Phomvihane Culture Centre in Laos’s Savannakhet province. Those projects are considered symbols of the close amity between the two Parties and countries. The above-mentioned cooperation outcomes have helped improve the offices’ specialised works and enhance the countries’ time-honoured friendship and special solidarity, they noted. The offices agreed to promote cooperation and support each other to fulfill important tasks, thus continuing to foster bilateral relations.